Always attention to detail, technical skills, passion in our work and great attention to customer needs are the strengths that have allowed us to excel in the field of sale of Airbrush Starter Kit ARISM 2 for temporary tattoos. Consultando il catalogo di Aerografando you will immediately notice how vast it is and how diversified the model range is Temporary Tattoo, you will find the best Airbrush Starter Kit ARISM 2 for temporary tattoos offers at the best prices on all Airbrush Starter Kit ARISM 2 for temporary tattoos of the brands Aerografando. A Sparmax kit for those who want to get closer to the world of airbrush with a durable and well-built airbrush and compressor. The Senjo Color range of temporary tattoo inks has been developed to best meet professional needs. The quality of the products is such that they can be sprayed without dilutions with very fine 0.2mm nozzles. Excellent also for brush applications, they can be diluted and cleaned with 99% isopropyl alcohol. They are mixable and have a particularly realistic effect on the skin. The Senjo colors have an excellent yield - a 15 ml bottle is sufficient for about 50 tattoos with a duration of 2/7 days on the skin. Read the reviews of our customers on Airbrush Starter Kit ARISM 2 for temporary tattoos of the category Temporary Tattoo. 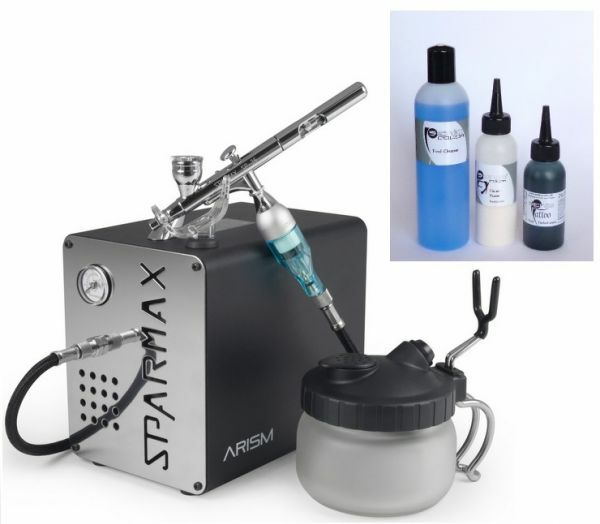 Review Airbrush Starter Kit ARISM 2 for temporary tattoos of the brand Aerografando. Trust in the quality and professionalism of Aerografando on the sale of Airbrush Starter Kit ARISM 2 for temporary tattoos, only from us you will find the best prices. You want to have more details on Airbrush Starter Kit ARISM 2 for temporary tattoos ARISM2tatuag or more generally on ours Temporary Tattoo? You are looking for a Temporary Tattoo but do not you find it in the catalog? Staff of Aerografando will answer all your requests.